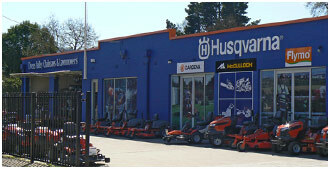 We are proud of our lawnmower range at Ovens Valley Chainsaws and Lawnmowers and are confident that we can find the mower to suit you.With experience and expertise in assessing your needs, we can recommend a product for you from our lawnmower range. Ideal for homeowners or for trimming complex areas, this intuitive hassel-free battery mower can mow an average-sized garden quickly and quietly in a single charge. The mower is easy to manouevre due to it’s light-weighted and compact deck and ergonomic handle make it easy to steer even round small places. Compatible with all Husqvarna BLi-batteries. Price includes Lawnmower $499, BLi150 Battery $249 and QC80 Charger $99. Components also sold separately. A robust but easy to use lawn mower with 46cm (18”) deck, powerful four stroke engine and four cutting blades to give a superior cut and finish to your lawn. Features include dual ball bearing wheels, comfort grip folding handles with quick action cam locks, safety zone starting, large plastic catcher and eight cutting heights. Comes complete with mulch insert. A versatile lawn mower with a larger 48cm (19”) cutting deck, powerful DOV four stroke engine and four cutting blades to give a superior cut and finish to your lawn. Features include dual ball bearing wheels, comfort grip folding handles with quick action cam locks, safety zone starting, large plastic catcher and ten cutting heights. Comes complete with mulch insert. A commercial quality lawn mower with a large 48cm (19”) alloy cutting deck plus a powerful DOV IC series four stroke engine and four cutting blades to give a superior cut and finish to your lawn. Features include dual ball bearing wheels, comfort grip folding handles with quick action cam locks, safety zone starting, large plastic catcher and eight cutting heights. Comes complete with mulch insert.